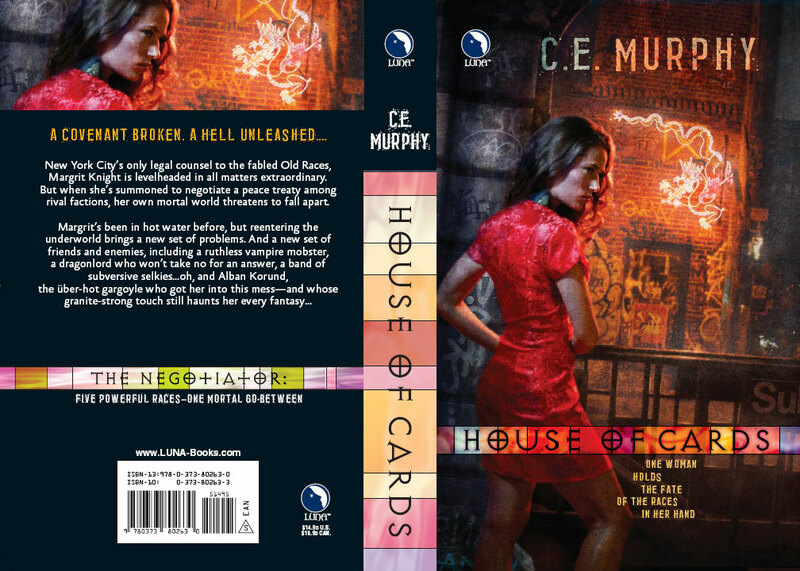 A few days ago I got email from my editor saying they needed front material for HOUSE OF CARDS, suggesting to me that they were, in fact, going to be publishing that book one of these days (not that there was any suggestion they wouldn't. It's just seemed like a particularly long road). So I asked about cover art, 'cause ... well, nevermind why, but I did, and lo! I have cover art! I've seen the (very, very) rough for the third cover, too, which is also going to be quite awesome. I love how different these are from the Walker Paper books. :) Yay! I can only get the Walker books in trade paperback size here in South Carolina. The book store people told me that mass size is going away and everything will eventually be in trade size. Beautiful covers for the new series. I was wondering if you'll have an excerpt up soon for Heart of Stone. I'm dying to get a sneak peek at this new series. I have enjoyed the Walker books and am looking forward to the Negotiator series. Cheers! Outside of Phoenix Law...you really have fantastically awesome luck with cover art. Wow! Nice! oooh... a good reason to work on it..Deal!